Voxer Walkie Talkie Messenger is a walkie-talkie app for mobile devices. You can chat with your friends by sending real-time voice messages, texts, videos, and pictures. The messages are delivered so quickly that you will forget you are not actually on a phone call with the person. 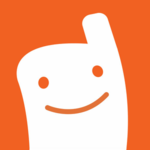 Voxer is great for group conversations to make plans, solve problems, and to share information. Voxer is also great for people who have difficulty typing due to fine motor or vision issues, those who are not strong spellers, and even for those who are not independent readers yet. Voxer may also benefit users with difficulty typing, spelling, or reading. Also those with visual impairments, since it can be used exclusively with voice messages only if the user chooses.